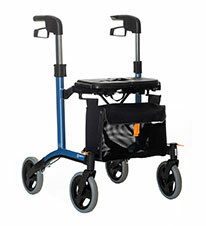 The Leia is a perfect rollator for those who place high demands on both design, quality and function. Thanks to the patented cross folding frame that enables ample walking space, the Leia offers the best possible ambulatory pattern ensuring less stress on both the back as well as the shoulders. The Leia is available in three different colors and three seat heights to allow you to find something ideal for you. The Leia is lightweight and very easy to maneuver, yet offers maximum stability.